Hill Hudson is a talented young illustrator studying at the Pacific Northwest College Of Art in Portland, Oregon. This year he had to complete his senior thesis, which usually involves doing an illustration. But Hill wanted to do something a little different and build a motorcycle. “I guess I’m the first to ever do this in the history of the 100 plus years the school as been running” he says. 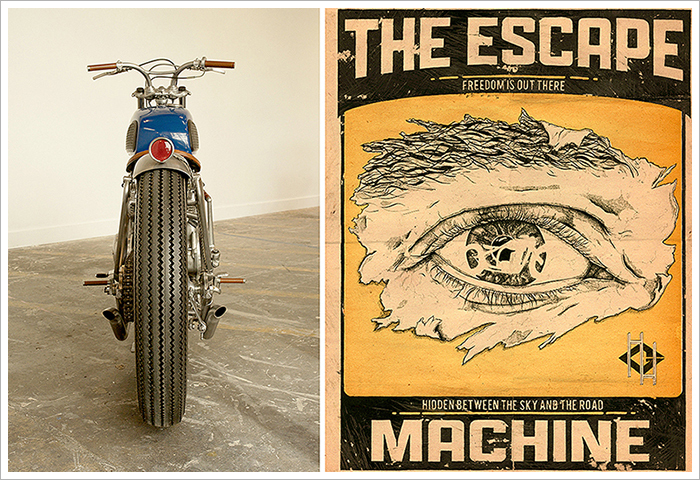 “This thesis will be documented and stored in the library here in Portland and will go down as the first art school breakdown and construction of a motorcycle in a gallery setting at this school”. Hill’s project started by searching for a suitable low cost donor. 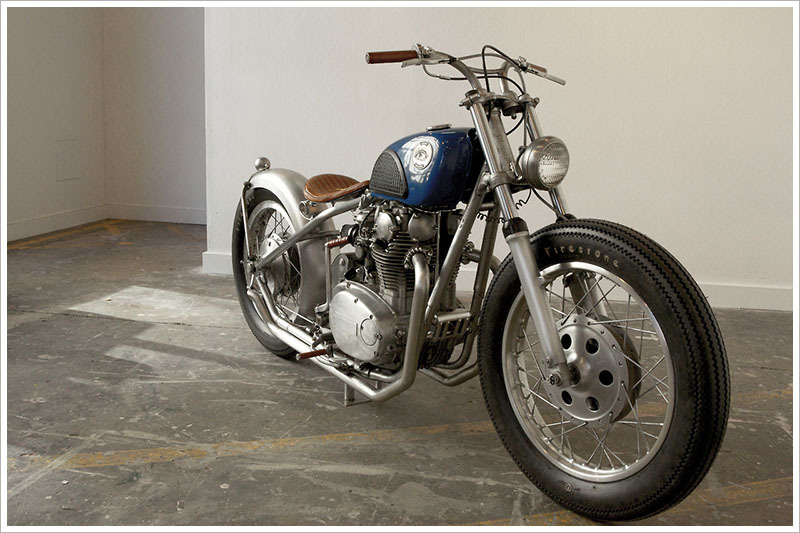 He eventually found a 1977 XS650 that was the perfect ‘blank canvas’ for his art project and got to work. Hill begun by stripping down the frame, cutting it up and tig welding on a TC Bros hard tail. He also bent his own tubing for the arched cross supports. 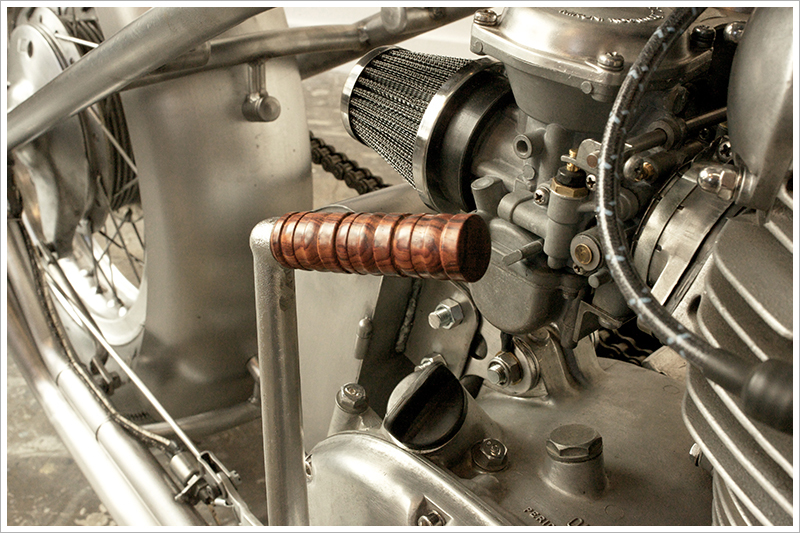 Hill made the pipes from scratch out of stainless steel sections of mandrel bent tubing. Tig welded them then sanded down the welds to give them that seamless look. 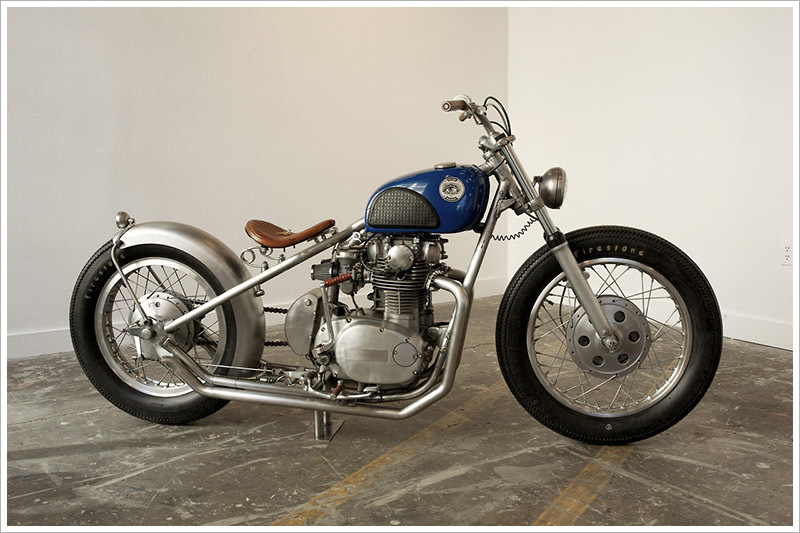 The rear fender was from Lowbrow Customs and he made all the mounting hardware for the seat, fender, headlight and tank on his little metal lathe. 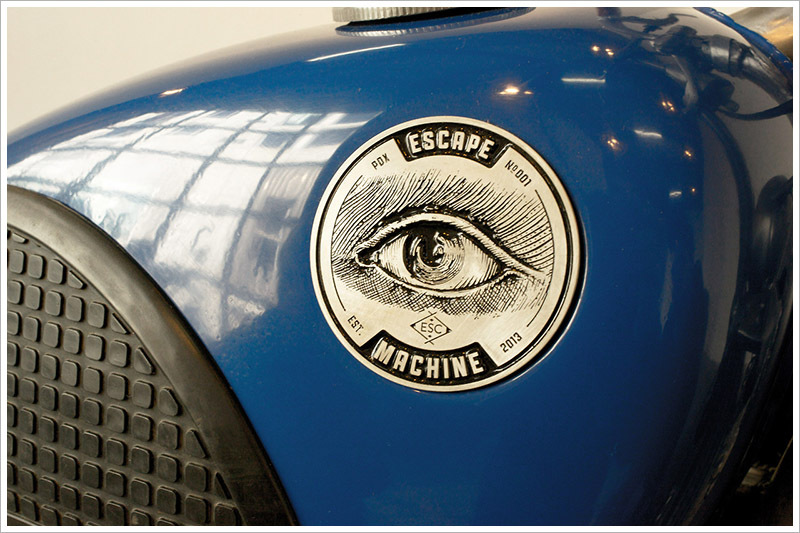 The beautiful little tank was sourced from an old Honda CL77, painted deep single stage blue and then given custom ‘Escape Machine’ badges that were acid etched into magnesium, then Hill hand painted the etched recessed areas with OneShot paint. 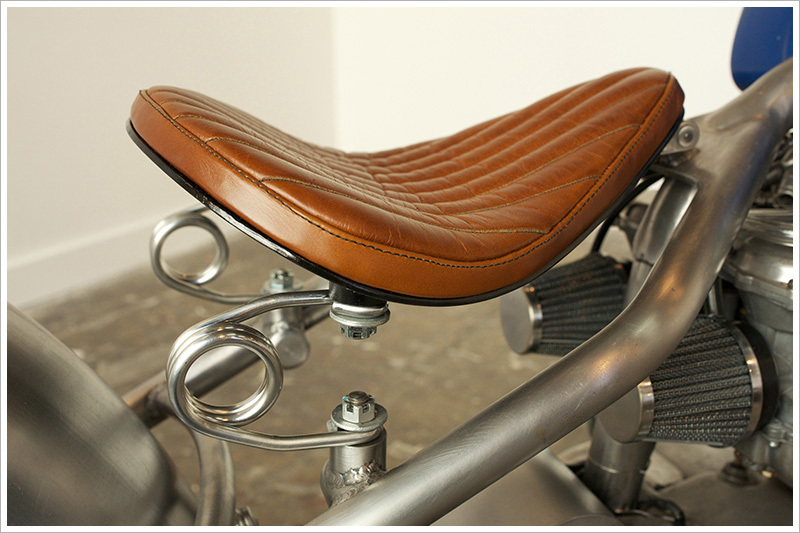 Hill also made the seat and seat pan from scratch using an industrial sewing machine to sew the leather. The headlight was taken off an old farm tractor, stripped to bare steel and then he made the mounting brackets for it. 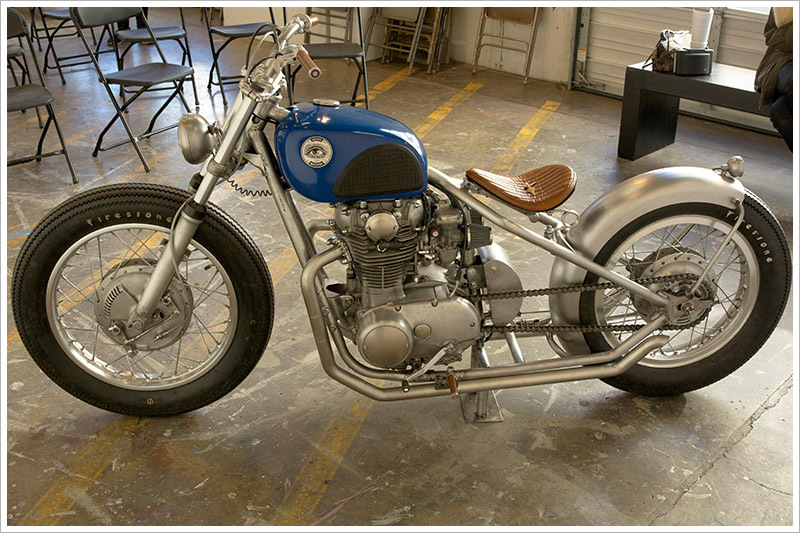 The tail light was made on the metal lathe by his friend James Crowe at Crowe Metal Co. “The bike was so neglected that most of my time was spent cleaning, buffing and rebuilding the engine” he says. After the build was complete, Hill had to take it to the art college for final judging. “People didn’t even really know what to ask after my presentation” he says. “One guy on the judging panel just couldn’t stop saying how much he liked it”. That sounds like a success to us. It’s great to see a young guy bucking the system and creating something outside the box in the name of ‘art’. Hill now wants to create a series of bikes under the ESC Collective name and we have a feeling we’ll be seeing a lot more from this guy in the not too distant future. If you need any illustrations done, be sure to hit Hill Hudson up via his website.